Original/Reproduction: Artwork Reproduction Size Type/ Largest Dimension: 8.5" x 11"
Edition Type: Open Edition Edition Size: 8.5" x 11"
Notice her stance as she puts on her tooled leather gauntlets and looks directly at you, the viewer! 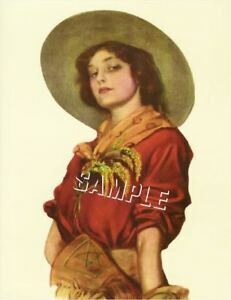 BEAUTIFUL ANTIQUE COWGIRL IMAGE! We have an ever-expanding gallery of exciting and unique ARTWORK for your consideration.